Somaliand President H.E Ahmed Mohammed Mohamoud Silanyo left for an official visit to France. During his trip, the president is expected to take part in multi-lateral talks, including talks with Bolloré Africa Logistics. The President H.E. Ahmed Mohammed Mohamoud Silanyo jetted out of the country yesterday afternoon for Paris, France on an official visit and would then proceed on to the UK later on. The President reiterated once more that the independence of Somaliland was not a mere state policy but a concrete constitutional charter prescribing the aspirations of the people hence that SL is expected to achieve its sovereignty in the long run. H.E. Ahmed Silanyo said that his Paris trip is an official one and is scheduled to indulge in multi-lateral talks touching on diverse issue with the French government. He confirmed that his itinerary would include talks with Bolloré Africa Logistics. “It is imperative for SL to engage with developed and economic giant countries in order to have impact and achieve its aspirations”, said the President. Confirming his engagements by multinational group, Bolloré logistics, he said, “It is my wish that the Berbera Port is fully fledged hence the reason I have to meet with Bolloré”. The President who was speaking to the media at the airport shortly before he left the country said that he would have a brief sojourn in Addis Ababa, Ethiopia. He said that upon heading for France for the official visit he would then proceed to the UK for a short rest and health retreat. He announced that he would officially be joined in France by the Foreign Affairs Minister Hon. Mohammed Bihi Yonis, the Presidency Minister Hon. Hersi Ali Hassan and their colleague Commerce Dr. Mohamed Abdillahi Omer. The President was accompanied by the First Lady Amina Sheikh Mohammed Jirde and National Planning Hon. Dr. Sa’ad Ali Shire. Berbera Port is a major gateway in this region of Africa and its upgrading will boost economy tremendously and provide the dynamics for development hence opening access to the landlocked hinterland countries. 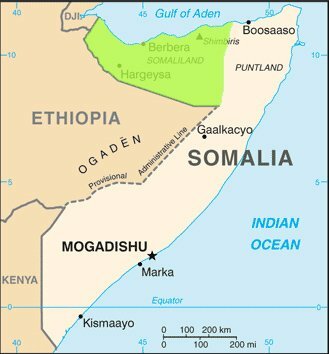 The group had recently confirmed that it was in negotiations with the Somaliland authorities to develop a port in Berbera, on the Gulf of Aden. “The Berbera port has indeed caught our attention,” CEO Dominique Lafont in mid December had told Port Finance International. During an interview in London, he explained that such a project could ease trade in and out of Somaliland. The port could also act as a gateway to neighbouring landlocked Ethiopia, Mr Lafont had elaborated. “With a population in excess of 90 million and a growing influx of foreign investments, Ethiopia is bound to play an increasing role in East Africa”, he had noted. It is more than fifty years since Bolloré group decided to start operations in Africa and develop there. In 2008, it created a brand, Bolloré Africa Logistics, uniting all its activities on the African continent and in the countries that have commercial relations with Africa. The dealer in multi-prong sectors, it is a leading integrated logistics network on the African continent and a specialized operator of public-private partnerships in the port and rail sectors. It has a huge territorial coverage and effective presence in 55 countries, including 45 in Africa and a workforce of 25,000. With its port expertise acquired over the years, it has a unique experience in the field. Bolloré Africa Logistics invests 300 million euros each year to develop and enhance the infrastructures under its responsibility, building complete transhipment platforms. For Bolloré Africa Logistics, the Berbera project is part of a wider strategy. The group, which has a strong port presence in western and central Africa, wants to expand those port activities to eastern Africa, where it already has logistics activities. In recent years, it won port concessions in Moroni (Comoros) and in Pemba (Mozambique). Besides this “Pan-African axis”, Bolloré has ambitions beyond Africa. A few months ago, it made its first port investment outside the continent: it acquired a minority share in a container terminal in Tuticorin, on the southern tip of India.